Showing 41 articles from March 16, 2016. LOUISBURG -- The continuing school budget crisis fueled by both the NC General Assembly and the Franklin County commissioners will again impact school staffing this fall with more cuts potentially on the way. Under a budget approved Monday night, the county schools will cut another 24 teaching positions -- 18 of them in elementary schools and six in secondary schools. That brings the total number of teacher cuts to 43 since the 2008 recession began. In addition the district has cut 23 teacher assistants and non-instructional personnel, all by not refilling vacant positions after resignations or retirement. LOUISBURG -- Just under 39 percent of Franklin County voters turned out for the primary, electing some new and old faces on the school board and setting up battles for the county commission this fall. Assistant Superintendent Tommy Piper beat out incumbent District 2 School Board member Synthia Richardson, 1,651 votes to 1,186. LOUISBURG -- There are going to be a number of new faces at Franklin County schools come fall, some the result of retirements and some because of reassignments. On Monday night, the school board accepted the retirement resignations of two veteran principals, Jewell Eason at Bunn Elementary School and James Harris at the Early College High School. YOUNGSVILLE -- The Town Hall has wiring issues. Cracks at the police department have been sealed with thick foam to keep out mice. Both buildings have poor roofs and electrical issues. And, the plumbing is so bad that if you flush the bathroom at Town Hall, you have to wait about 30 minutes if you want to use the one at the police department. 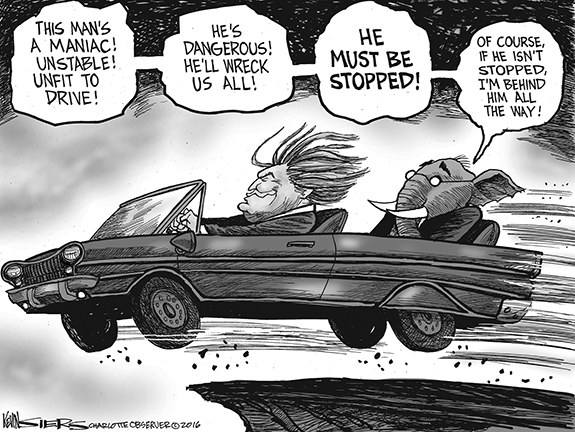 Risky constitutional amendment might protect us! After a sleepless night recently, I had an epiphany: North Carolina must modify its constitution. 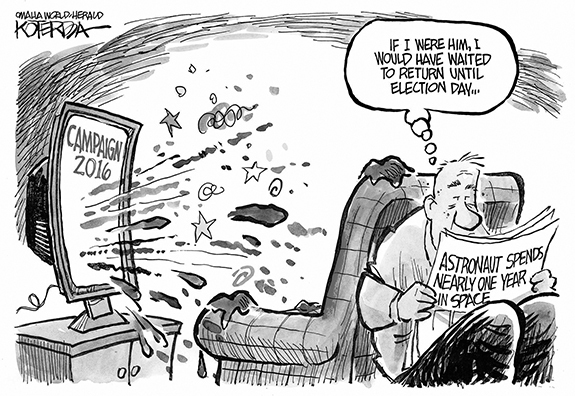 I've always been deathly afraid of Constitutional amendments because of unintended consequences. But I can't see an alternative. The amendment should specify that, under penalty of death for violation, no public building could ever again be built with a flat roof -- or a nearly flat roof. 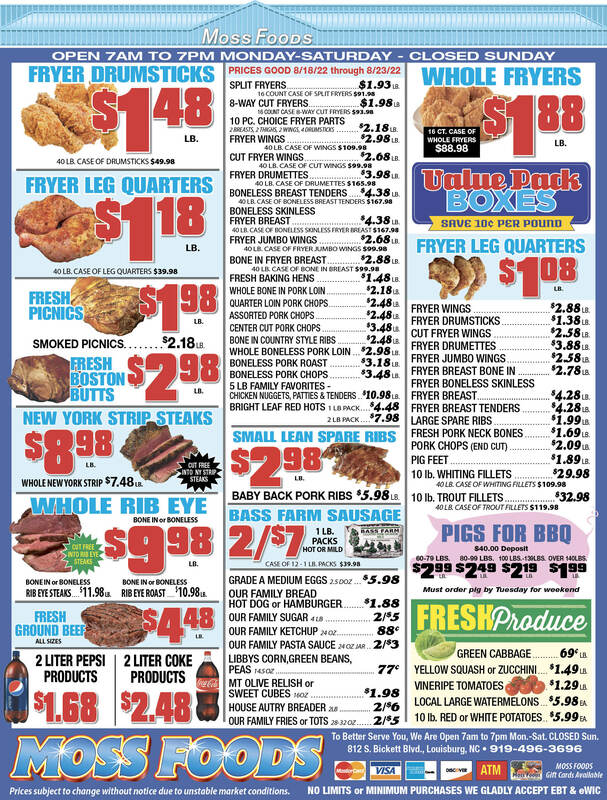 Spring is springing -- and will be here officially in just a few days. While the season means many different things to different people, a couple of pertinent facts are worth pointing out along with a cautionary note. As temperatures warm and it becomes even more pleasant to be outside, certain kinds of accidents become more common. A case in point happened last week when a coed, crossing North Main Street at Louisburg College was clipped by a passing car. An annual report that ranks the healthiest places across the country has Franklin County somewhere around the midsection of healthy counties in North Carolina. You wanna guess where the county scored the worst? Here's a hint, it was in two categories and both can be extremely deadly. While the county had fairly pedestrian ratings on issues such as length of life and quality of life, there were two issues that anyone who has spent more than a day in Franklin County knows dragged the rating down. When evaluating the worth of a public official, the first thing I consider is their judgment; one of the best ways to ascertain whether it is good or not is to review their priorities. Recently, the Republicans in Raleigh gave an issue the highest priority they have given anything since gaining control of the General Assembly in 2011. Was it nuclear war? Was it a foreign invasion? A few days ago we learned who the winners of the 2016 Primary Election were. To all that competed honorably and fairly, thank you for taking on the challenge. To those that took the low road, bending the laws as you lied about your competition, shame on you, and shame on those who knowingly supported your dishonesty. LOUISBURG - John Franklin Harris, IV (Tripps), of Louisburg, went to the Lord after a 5-year battle with cancer. YOUNGSVILLE - Bonnie Oakley Arnold, 72, died at Hock Family Pavilion in Durham on Friday, March 11, 2016. A memorial service will be held Sunday, March 20, at 3 p.m. at South Main Baptist Church, 601 S. Main Street, Wake Forest. Family will receive friends at Tammy's home at their friends' convenience. ROCKY MOUNT--Funeral services for Isiah Joshua Johnson, 28, who died Sunday, March 13, 2016, will be held Saturday, March 19, at 11 a.m. at Union Hill Baptist Church, with the Rev. John Richardson officiating. Burial will follow in the Forest Hill Cemetery. HENDERSON - Funeral services for Lonnie Edward Richardson, 80, who died Tuesday, March 15, 2016, will be held at 1 p.m. Saturday, March 19, at Pine Chapel Baptist Church in Hollister, with the Rev. Robert Hedgepeth officiating. Burial will follow in Pine Chapel Memorial Gardens. EXLEY ON THE MOVE. 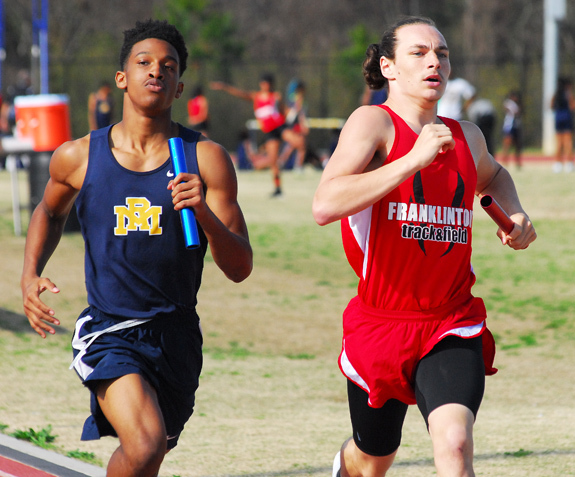 Franklinton distance standout Baretta Exley (right) holds on to his Boys 3200 Relay lead as part of Monday afternoon's four-team track and field meet at Rocky Mount High School in Nash County. 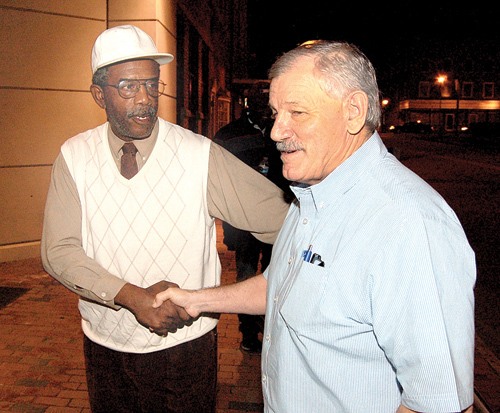 ROCKY MOUNT -- When Clennie Wilkins took over the Franklinton High School track and field program before last year following the tragic passing of long-time coach Trent Sanders, his first thought was how he could possibly continue the success Sanders had enjoyed. After a bit of trepidation, Wilkins dove into the challenge and continues to add to the foundation that Sanders built. 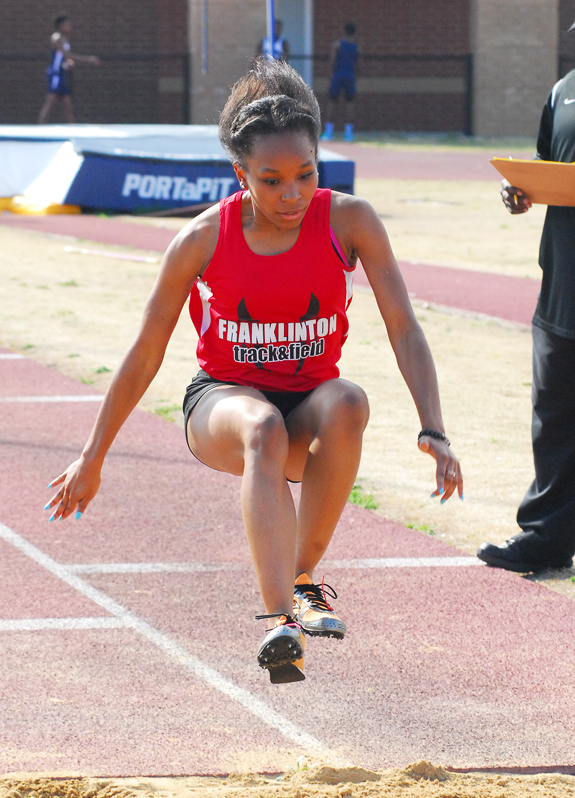 Franklinton has developed into an area track and field force, and numbers are at an all-time high for the program, which currently features a whopping 86 competitors. KOSTANDIN'S KEY CATCH. Louisburg College's Ryann Kostandin (right) catches a pop fly during the Lady Hurricanes' home doubleheader softball sweep against Richard Bland last Saturday afternoon. LOUISBURG - Thirteen has proven to be a lucky number for Michelle Carlson in her first season as the Louisburg College fast-pitch softball coach. As part of their torrid start, the Lady Hurricanes reeled off 13 consecutive victories, culminating with a twinbill sweep last Saturday at home against Richard Bland College at the renovated Sheilah R. Cotten Field. Louisburg's streak came to a close Tuesday on the road at Surry Community College as the Lady Hurricanes settled for a split. FRANKLINTON -- Jay Koloseus' commitment to building his Louisburg College cross country program with top area talent is continuing -- and seems to have no end in sight. Pictured (Above): LOGAN'S RUN. Franklinton High School's Logan Hornyak (front, center) signs a letter-of-intent to continue his cross country career at Louisburg College. Also pictured are (l to r) LC coach Jay Koloseus, FHS coach Clennie Wilkins, FHS Athletic Director Jeremy Crawford, FHS coach Ben Snelling and FHS coach Brittini Pittman; (front, l to r) parents Amie and Joshua Hornyak. CRAFTY LEFTY. 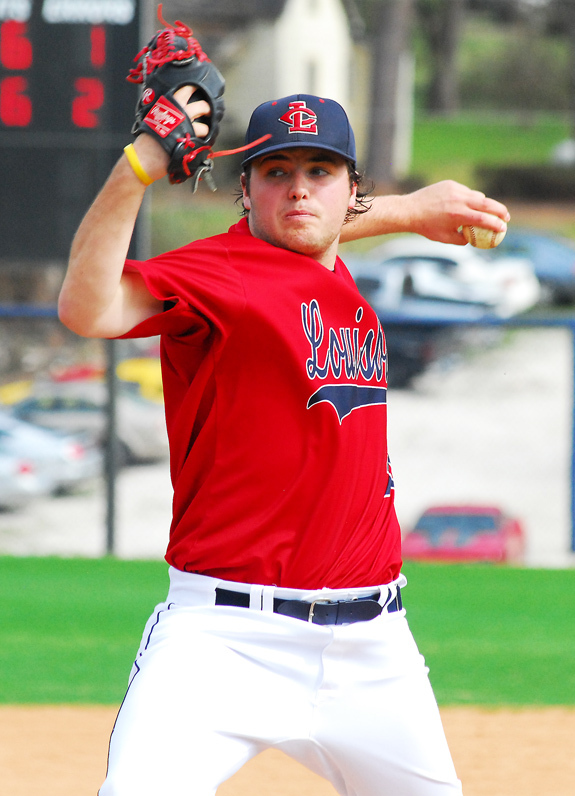 Louisburg College's Kyle Valentine delivers a pitch during last Saturday's home doubleheader against the University of South Carolina-Salkehatchie at Frazier Field on the LC campus. 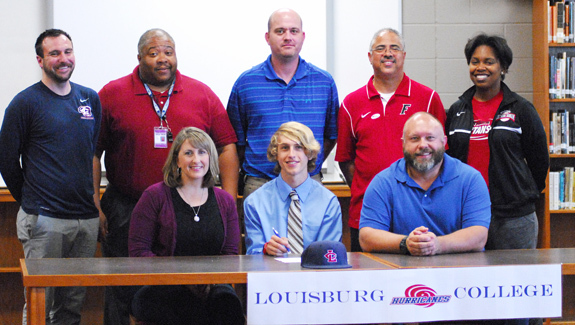 LOUISBURG -- In the estimation of new coach Blake Herring, the Louisburg College Hurricanes have the potential to be a factor this spring in the always-competitive Region X baseball standings. But for that to happen, the Hurricanes will have to become what Herring refers to as a 'seven-inning team'. "We tend to respond to the challenge when the game is on the line,'' Herring said. BUNN -- Bunn couldn't have asked for a more perfect beginning to its Northern Carolina Conference fast-pitch softball schedule. 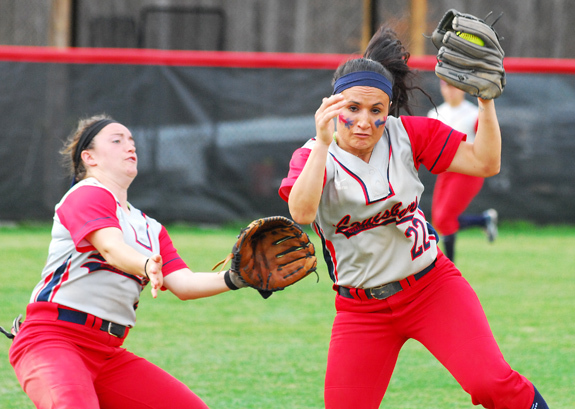 Last Friday at home, the Ladycats opened their NCC slate with a 17-0 victory over the Southern Vance Lady Raiders. Bunn veteran pitcher Erica Davis offered a rare performance as she faced 15 Southern Vance batters during the five-inning contest -- and struck out every one of them en route to notching her second perfect game of the 20-16 campaign. FRANKLIN COUNTY -- Franklinton made the boys basketball season one to remember in the Northern Carolina Conference. 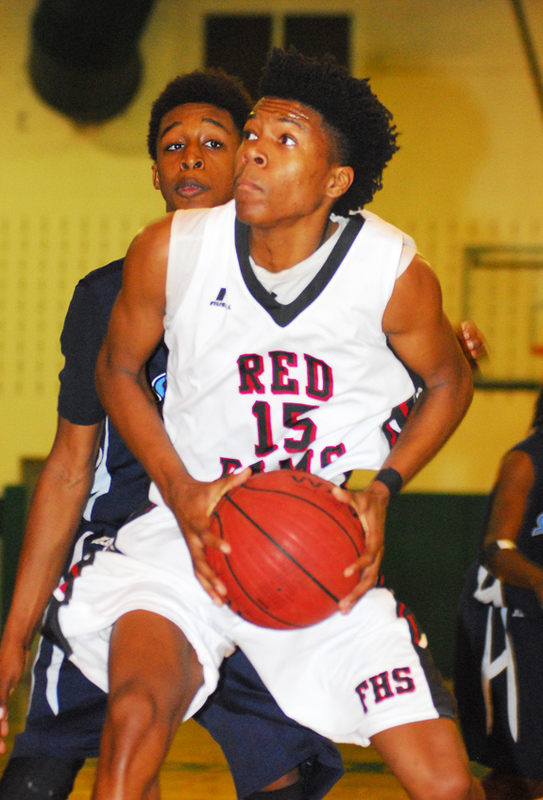 The Red Rams, guided by veteran skipper Terrence Horne, won the NCC regular season championship for the first time in the past decade and also reached the finals of the NCC Tournament before dropping a nail-biter against Southern Vance. For his efforts, Horne has been saluted as the NCC Boys Coach of the Year. DANVILLE, ILL. -- So far so good for the Louisburg College Hurricanes at the National Junior College Athletic Association Division II Men's Basketball National Tournament. The sixth-seeded Hurricanes, who won the Region X regular season and tournament crowns, opened up their national quest on Tuesday with a 105-91 decision over South Mountain College out of Arizona. GREENVILLE, S.C. -- Furman University women's basketball players Whitney Bunn, Holli Wilkins, and Kaitlyn Duncan have garnered consensus post-season honors in balloting by Southern Conference head coaches and media, the league has announced. Bunn was named first team All-SoCon, Wilkins earned second team accolades, and Duncan landed SoCon All-Freshman Team honors on the two squads. "I am extremely proud of Whitney, Holli, and Kaitlyn," said Furman head coach Jackie Carson. HENDERSON -- The 2015-2016 season recently came to an end for the Vance-Granville Community College Vanguards men's basketball team with a loss in the National Junior College Athletic Association (NJCAA) Division II Region X tournament, the first two rounds of which were held at Richard Bland College in Petersburg, Va.
VGCC ended the regular season with a 4-13 record in conference play, making the Vanguards the ninth seed in the 11-team tournament field. ZEBULON -- The Carolina Mudcats, the Class A Advanced affiliate of the Atlanta Braves and member of the historic Carolina League, have announced that individual game tickets for the 2016 season are now available for purchase online, over the phone and in-person at Five County Stadium. Fans looking to purchase tickets for the 2016 season are invited to call a front office representative at (919) 269-CATS (2287), visit www.carolinamudcats.com/tickets or purchase in-person at the Five County Stadium office. Franklinton's Briana Gunther competes in the long jump Monday afternoon. 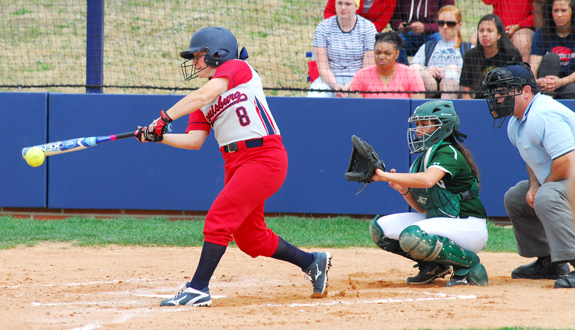 Louisburg College's Taylor Subacius rips a single during last Saturday afternoon's home softball twinbill versus Richard Bland College at Sheilah R. Cotten Field. 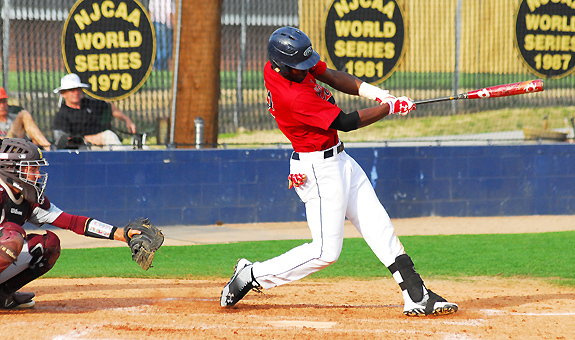 Louisburg College's Bryce Myers blasts a single during last Saturday's baseball action. Long-time Louisburg College baseball fans will remember Ricky Howard, a slugger who starred for the Hurricanes from 2003-05 before finishing off his career on the Division I level at Campbell University. 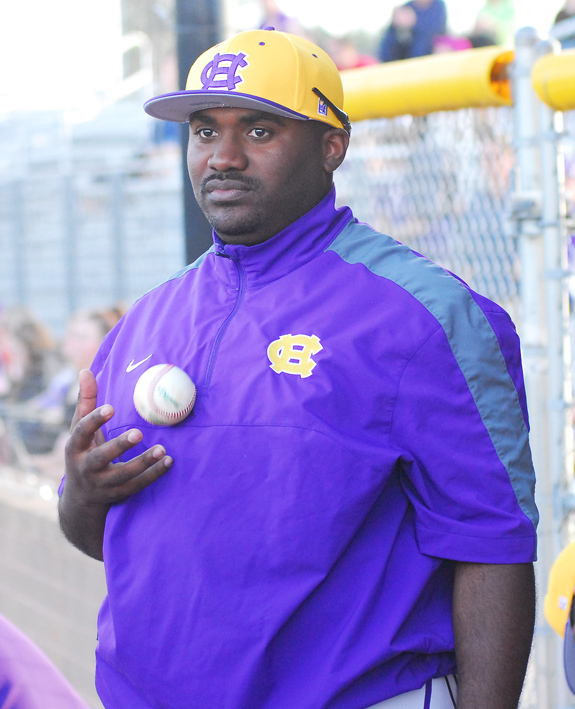 Howard, who prepped at nearby Southern Nash, is now an assistant diamond coach at Class 3-A Corinth Holders High School in Johnston County. 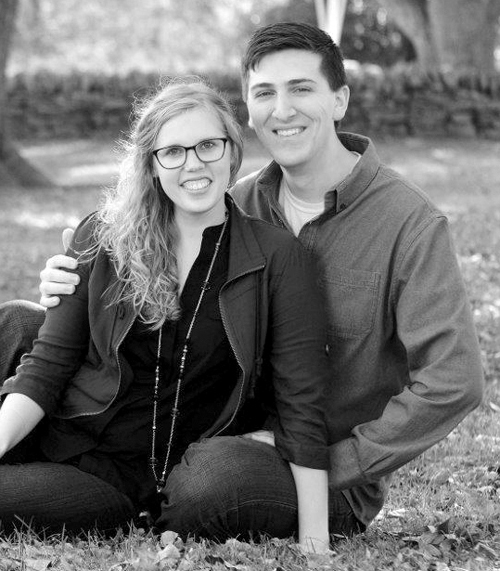 Mr. and Mrs. Christopher Hedrick and Mr. and Mrs. Clay Cannady of Franklinton announce the engagement of their daughter, Kristin Snow Hedrick to Michael Paul Nastasi, son of Mr. and Mrs. Joseph Nastasi of Wake Forest. A May wedding is planned. 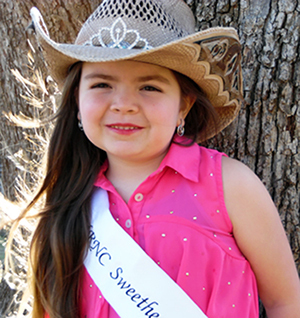 RODEO SWEETHEART -- Julie Ford, 6, of Epsom was crowned Miss Rodeo North Carolina Sweetheart during the first Miss Rodeo pageant held in the state in recent years. The first grader at Laurel Mill Elementary competed Jan. 30 in the Miss Rodeo North Carolina pageant at the Southeastern Ag Center in Lumberton, in conjunction with an N.C. Horse Council Show. She is the daughter of Darlene Vaughan-Peoples and Jack Peoples. The Miss Rodeo N.C. pageant is the state division of the Miss Rodeo America pageant. Deputies are looking for suspects alleged to have shot at an occupied house. According to a report, a resident at a home in the 1400 block of Walter Grissom Road reported hearing gunshots the evening of March 12. Deputies found a shell casing, but didn't find evidence that the home was hit. LOUISBURG -- The county's planning board recently recommended county commissioners approve what would be the largest solar farm in Franklin County. Carolina Solar has proposed building a 278-acre solar farm on just over 701 acres off T.K. Allen Road. If approved, it could be the company's third solar farm in Franklin County. Last week, county commissioners approved a 40-acre Carolina Solar farm proposal located off Tides Lane off N.C. 39, and the planning board at its meeting the next day recommended that commissioners approve another Carolina Solar farm, 65 acres on May Day Drive. The United Way of Franklin County's grant cycle for 2016 is open through April 21. Any non-profit agency in the county or government exempt program can apply. Applications (eight copies) may be mailed to PO Box 342, Louisburg, NC 27549 or hand delivered to 101 N. Church Street, Louisburg. LOUISBURG -- The passenger in a fatal wreck that investigators believe was fueled by alcohol is suing the owner of the store where he alleges beer was sold to the underage driver. Perry Jackson Frazier, 18, was driving a pickup truck during the early morning hours of Oct. 10 when he ran off the road, hit a tree, was ejected and killed. According to the March 7 lawsuit, his passenger, Dustin Garriss, 18, suffered a traumatic brain injury, fractures of his cervical spine, and an avulsion -- tearing away -- of his left ear. FRANKLINTON -- Police arrested two Cary women on heroin charges after catching them in a compromising situation. Officers responded to a report of indecent exposure during the evening hours of March 9 to find Sarah Sims, 26, and Page Csonka, 25, in a car in the Walgreens parking lot. As one of the suspects, who was in a state of undress, put her clothes on and got out, according to the report, police allege bags of heroin fell from her shorts. RALEIGH -- A jury awarded a sheriff's deputy close to half a million dollars for injuries she suffered as a highway patrol cadet back in 2008. Attorneys for Jennifer Martin hope the March 2 verdict serves as a catalyst for change within the State Highway Patrol's cadet program. "... We are now hopeful, finally, that there will be an honest examination of practices there so that this does not happen to any cadets in the future," attorneys Leonard Jernigan and Robert Zaytoun said in a statement. YOUNGSVILLE -- Heavy rain earlier this week caused a sewage spill. The rain came in with a storm Monday night into Tuesday, causing about 3,600 gallons of untreatead wastewater to get into a tributary. According to the county's public utilities staff, the main cause of the bypass as attributable to the direct inflow of stormwater into the sewer collection system. The spill in Youngsville, which was located off of S.W. Railroad Street, is estimated to have released 3,600 gallons into an unnamed tributary of Richland Creek. 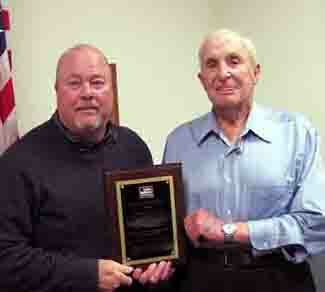 Wayne Champion (left) was recently recognized for 25 years of service with N. C. Farm Bureau Mutual Insurance Company. 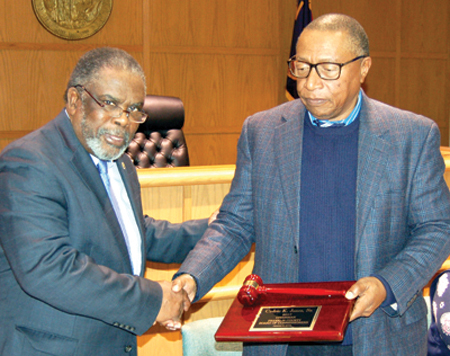 He is shown here with Bennie Ray Gupton, president of the Franklin County Farm Bureau, who presented the award. A lifelong resident of Franklin County, Wayne was contracted as an agent with Farm Bureau on Feb. 1, 1991, and earned his professional LUTCF designation five years later. 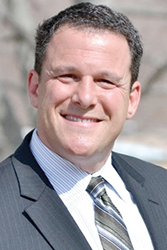 During his 25 years of service, he has received many awards for his sales achievements from Farm Bureau, including Master Agent and "Top 75" which is given to top producing agents each year by the company.